Periodontal maintenance care every 3-4 months is usually necessary for patients who are diagnosed and highly susceptible to periodontal disease. 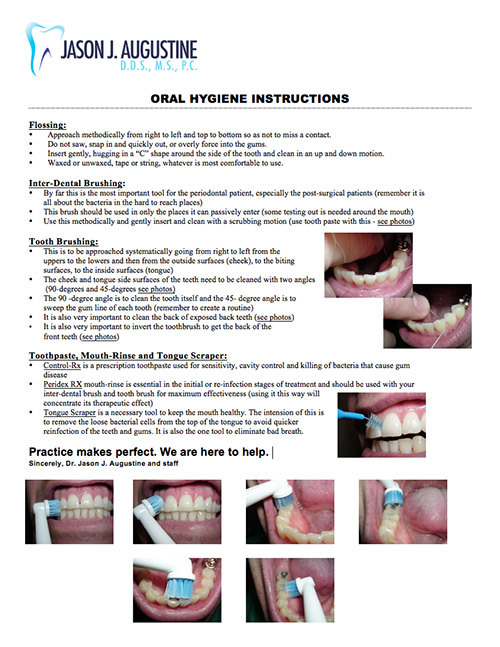 Periodontal maintenance is necessary for long term oral and periodontal health. This 3-4 month recall therapy is an ongoing hygiene program designed to prevent recurrence of periodontal disease in the gum tissue and bone. Periodontal maintenance is necessary for patients who are very susceptible to periodontal disease and especially for the more advanced cases that have been comprehensively treated. Maintenance visits to Jason J. Augustine D.D.S., M.S., P.C. will help prevent additional dental and periodontal problems in the future. During a maintenance appointment, you will be seen by one of our highly trained Hygienists for a cleaning and examination and troubleshooting for any recurrent disease. Gum disease is not curable but can be very well managed with excellent effort and commitment by the patient, and professional co-management with Dr. Augustine and staff. Dr. Augustine will periodically check your mouth to ensure that the disease is in check and that there are not additional periodontal problems requiring additional care. Dr. Augustine will recommend how often you should have a periodontal maintenance visit. The frequency will be determined by the type or stage of periodontal disease you have, the type of periodontal treatments you have had in the past, how you’ve responded to those treatments, and how quickly you develop plaque. The most important factor, however, is how dedicated you are to good hygiene at home. This video shows you how plaque and calculus adhere to teeth and cause gum disease. This video shows you how to properly brush your teeth to remove plaque and food particles and promote a healthy mouth and smile.